The Office of Campus Ministry focuses on individual faith formation by providing weekly Mass and Reconciliation, daily prayer opportunities, liturgical events, retreats and individual pastoral guidance for students and faculty. The importance of individual participation and Christian unity among school community members is promoted, and the liturgical seasons of the Catholic Church are incorporated into all school liturgy planning. In order to encourage a connection with the wider Catholic community, North Deanery pastoral leaders are invited to all campus ministry events. The Bishop Chatard service program utilizes a “just get them started” philosophy. We require a minimum number of service hours so that students are exposed to the gift of serving others. Once immersed in service, students quickly see the benefit to others as well as to themselves – they are being formed as Christian servants. While teachers and staff members throughout Bishop Chatard support service opportunities and work with students to help them fulfill this important part of the Bishop Chatard mission, the true success of the service program rests is dependent on the commitment of our young men and women. 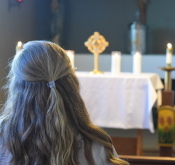 Bishop Chatard supports a structured retreat program designed to enable students at every grade level to reflect on God’s presence in their everyday lives and how they might bring God’s presence to others through discipleship. The retreat experiences allow each student an opportunity to connect their knowledge of faith and Christian values with actual life situations. The goal of each retreat is to bring the students to Christ in order to reiterate the importance of having Christ at the center of one’s life. Freshmen attend a day of reflection during the school day, while sophomores attend a one-day retreat experiences at CYO Camp Rancho Framasa. Juniors have the opportunity to attend an overnight retreat. The retreat program culminates with the Christian Awakening Retreat, an extended retreat experience that occurs during senior year. A natural outcome of faith formation – liturgy, retreats and service – is the development of Christian leaders. Students see the value in what they have experienced and step forward to pass it on to the younger students, truly building the Body of Christ. 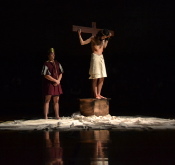 Students play an integral part of all campus ministry activities, especially the school’s liturgical events. In addition, a core team of juniors and seniors are trained to serve as team members for the underclass retreats. Campus ministry is responsible for organizing and training adults and students to share their faith and gifts in order to create a sense of Christian community at Bishop Chatard. Service Hours need to be logged on MobileServe prior to Wednesday, May 1, 2019. This service requirement is noted on high school transcripts. 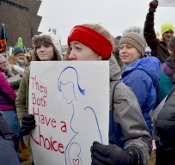 View a list of agencies you can serve at. Follow the BCHS service twitter, @BCTrojanService, for additional opportunities. View Service Hour Requirements and MobileServe directions. Spring break is a great time to get out into the community and help someone out. In gratitude for the 10 days that we have off and the appreciation for being a part of the BCHS community, let's all give something back like we did on Community Service Day. Questions? Email Mr. Bach (jdbach@bishopchatard.org) and Mrs. Bach (jbach@bishopchatard.org) or stop by our rooms 106 or 306. This program is open to high school students who want to learn more about taking on leadership roles as young missionaries to serve and impact their communities and world through the local church. This event, held every other year, aims to raise students’ awareness of homelessness in Indianapolis. BCHS students spend a night ‘outside’, experiencing life as a homeless person might. Online parent permission forms for retreats are now available. As tragic deaths happen around us, whether close by to people we know or in the world at large, we wonder how to make sense of the sorrow and loss. Youth especially often struggle to handle sadness they have or to console those they know who are feeling the loss deeply. We offer these resources below as a starting place for any parent to recognize suffering and guide their child in coping with their feelings or depression. If you, as a parent or student, have any concern or questions, please do not hesitate to contact someone at the school who you feel comfortable with. Anyone in the Campus Ministry department, the Guidance Department, a close teacher or administrator at BCHS will be more than happy to guide you. Other parents may also be a help.